Tomorrow morning Tiger Beetle, along with rob (me) and Lindi (newly on board) will be rolling out of San Jose Del Cabo and Mexico in a short while, headed out onto the big blue highway aiming for points northwards. This is the 'big leg' of the summer, perhaps 3500 miles of sailing from the southern tip of Baja California, Mexico - up to the Strait of Juan de Fuca that separates Canada from the United States. First land fall is intended to be Friday Harbor US Customs dock, in the San Juan Islands. And then commence enjoying the waters north of Seattle, such as the San Juan Islands, Desolation Sound, Vancouver Island, and points north in British Columbia, Canada. The boat is looking pretty good, yesterday was the big shop at Wal Mart Super in Cabo, Victor Barrera's agent Daniel checked Lindi and I and Tiger Beetle out of Mexico - yep, we are allowed to leave - and Beetle has its first zarpe (paperwork allowing departure from the country). Often the next country one arrives at will want to see the prior country's zarpe, as having a zarpe means you departed the prior country in good standing. Getting a zarpe before departing the US is problematic as the USA Immigration/customs/border patrol (DHS) doesn't issue zarpes to recreational boats - which means that often US boats arrive with no exit paperwork indicating it was ok to depart the USA. At least in Mexico they didn't ask for a zarpe, once I told them I had come from San Diego. On the subject of 'it is a small world' - a 35' sailboat arrived the morning after I did, and the fellow on board was Ralph. 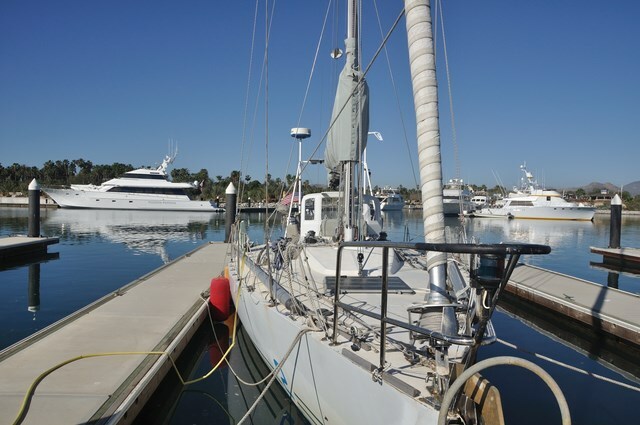 He had retired, bought his boat in Sausalito and outfitted it for going to the Marquesas, then decided to go to La Paz first. I invited him over to Beetle for a sunset beer, Lindi was here, and it turns out that Ralph had his boat at Mario's slip in Grand Marina (right down the dock from Beetle and opposite Kristen's boat), Mario did the welding work on the stern pulpit, Lindi had met Ralph there and invited him up to Arne's shop Christmas party, and at the party he had met Kristen. And now, four months later, the same boat pops up next to Beetle here in Cabo - tiny world, eh? I've dived the bottom of the boat, removed the extra-sticky and apparently super-fast growing barnacles from the underside - a whole lot of tiny 1 mm barnacles that knock off easily, and around 20 big centimeter size ones that are actually difficult to remove - they are gone as well. How these fellows adhere and grow so darn fast is beyond me; the bottom was really clean 3 weeks ago... oh, and there was one solitary gooseneck barnacle trying hard to cling on at the transom - that one was also consigned to the deep. The little Honda generator is chugging away on the foredeck and bringing the batteries up to full voltage - always nice to start a trip with topped-off batteries. Where Beetle will show up next is difficult to tell. The weather forecasts are quite good out 2 days, when you go out four days it gets iffy, and beyond that is pretty much crystal ball gazing. Unfortunately for me, the boat doesn't go that fast - so I really don't know what the weather is going to be down the road. The full trip to Washington is perhaps 25 days - too long into the future to have a forecast and plan accordingly. What I have done is come up with a series of bail-out options should weather to the north look bad enough that I don't want to get caught up in it. Generic plan is to depart Cabo on a SW trajectory and use the trade winds to move 750 miles west of Cabo - that gets us all the westing needed and puts Beetle on a longitude roughly suitable for San Francisco (I am way east of San Francisco, CA now). This is well south of all the nasty Lows up in the Gulf of Alaska, and a fairly straightforward sail. Once out there the plan is to arc NW relative to the winds and start to parallel the coast. This is where the forecasts begin to fall apart, as it will take 4 to 5 days to get 'out there' in the first place, and the forecasts aren't accurate that far into the future. If weather to the north looks bad, the first bail-out is Southern California. Should be easy to get to as this is generally speaking south of all the nasty weather up near Alaska. If we got to San Diego (short trip! ), it would be a hop across Southern California to Santa Barbara, and from Santa Barbara wait for a two-day weather window and run the boat up to San Francisco. Then wait for more stable weather (primarily Pacific High stabilizing) and then push on to Washington. Bail-out option no. 2 is San Francisco - a bit more in the future than Southern California, and barring a major storm coming down the coast it is likely we could get to SF without too much trouble. Beyond SF it gets more interesting as we are getting closer to the big Low pressure systems that are still sweeping out of Japan and into the Gulf of Alaska. There is a port of refuge in Oregon, up near Portland: Port of Newport, Oregon; this is about half-way from SF to the Strait, and this port does not have a significant bar to cross to entry and therefore doesn't usually close in the event of a big storm. If weather looks good north of San Francisco as Beetle approaches the bail-out turning point east towards San Francisco, then we can proceed north for some days and then if we had to, run for the coast and into Port of Newport. If everything works out fine and we don't run into a major Low, then best of all possible worlds is Beetle arrives at the Strait of Juan de Fuca in late April, with the Friday Harbor customs dock ahead of us. It's Wednesday morning - and based on current weather forecasts the goal has shifted from aiming all the way at the Pacific Northwest, and instead now aiming for Santa Barbara (actually, Long Beach - there's a US customs dock there). The weather remains unsettled to the north, the current plan is to get out west for two days, at which time the winds are forecast to soften and then I will point Beetle more NW, aiming for a point roughly 30N x 130W. The very long term forecasts call for a cut-off low to appear off Southern California with a bunch of northerly wind behind it as the High squeeze in. If that actually happens then it would be nice to be east of that Low (around 30N x 135W) such that we can ride north-east towards Southern California, and later reach in to the coast on port tack if the High really does bring in strong northerly winds. The breeze is also forecast to go dead come Monday/Tuesday over the whole area - at which time we would motor slowly northwards. 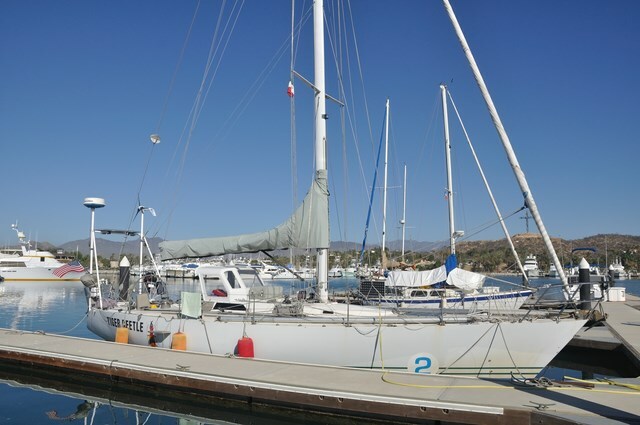 If the wind does fill from the north, then it would be nice to be in a position to come into Southern California on port tack without too much crashing. From there re-group, re-fuel, and see what happens next! Should not be too difficult to run up to San Francisco from Southern California, and wait there for a better weather window to set up for going north. So that's the plan this morning! Not to worry, everything can change with each set of forecasts that come in. Beetle at Puerto Los Cabos, these are gigantic slips that are way too long and way too wide for the boat - good thing to have long dock lines. There's no power to this dock, and that keeps the cost down as the marina charges less when you don't have power. On the plus side, these are the docks that are closest to the showers. The marina office is on the opposite side of the marina from where I am, lots of huge power boats here that go out and chase marlin. I haven't seen anyone actually bring in a marlin, so perhaps they are using the catch and release approach to fishes. 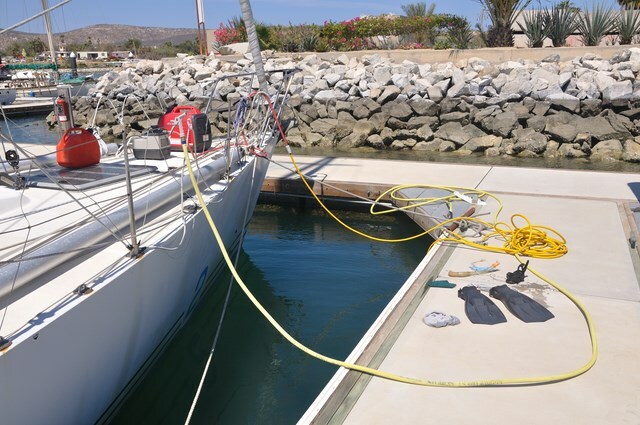 Dived the bottom yesterday, that's the honda generator attached to the air compressor attached to 60' of yellow hose attached to the regulator, and that makes it really easy to work under the boat. There were tons of tiny little barnacles the size of a large grain of sand, and maybe 20 larger ones that are the size of half a dime in diameter. I'm amazed at how quickly these little buggers grow - the bottom was clean for the Banderas Bay racing just three weeks back. They are gone now! Zincs look good, too - nothing to replace there, and the propeller has been cleaned up again. Editors Note: Faollow all of Tiger Beetles Adventure ans reports HERE!! !